One of the conventions in Altimeter, our CSS components library, is how element states like hover and active are made. Instead of inventing new shades for each element, we have a system of overlaying and blending colors from our palette. A naïve implementation would just copy the blended hex values from Sketch. However, almost exactly the same effect can be achieved by blending colors in Sass. While Sass provides a lot of useful functions for color handling, including the mix function for mixing colors, our needs were more complex—we needed Photoshop-like blending modes, as some of the more complex effects relied on modes like Difference. As it turns out, there’s a neat SCSS functions library that does exactly that. Although the naïve approach would have worked, we’ve benefitted significantly from the programmatic implementation. It’s much easier to deal with color variables and functions that clearly reflect the original intention than to deal with hex values copied from Sketch. It has also made it much easier to introduce variants of elements—for instance, when a green variant of the blue button was needed, it was only a matter of replacing the primary color, while carrying over the same calculations for hover and active states. The library did not support this use case: it would output an opaque color, even if two transparent colors where given. Given the flexibility of SCSS, it really pays off to handle color calculations in code, improving both the readability and maintainability of the code. 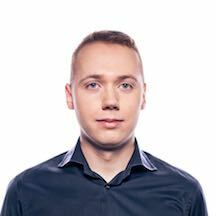 Jan is an experienced full-stack web engineer who cares about great user experience.